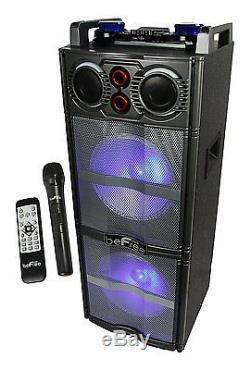 BeFree Sound Double 10 Inch Subwoofer Bluetooth Portable Party Speaker with Reactive Lights, USB/ SD Input, FM Radio, Remote Control and Microphone. BeFree Sound's Sound Double 10 Inch Subwoofer Bluetooth Portable Party Speaker is an all in one party companion! This Speaker not only delivers clear and extremely power sound, but provides a light show to go with it. Each of the large 10 inch Sub-woofers has built in reactive party lights which illuminate and liven up any scene. The unit features a top control panel with two large illuminated volume control nobs with a stunning blue halo light. Separate volume control for the included Microphone and the general speaker volume allow you to control the sound settings to perfection. Whether you will you this unit for public speaking, or social events, you simply can't go wrong. Features: Bluetooth FM Radio SD Input USB Input Built in Reactive Party Lights Two 10 Inch Sub-Woofers Line in L and R Rechargeable Battery -Charge / Charge Full Indicator Built in Side Handles Two 2.75" Tweeters 2.5" Illuminated Mic Volume Knob 2.5" illuminated Volume Knob Digital Setting Display Two Top Handles 8.5" x 2" for easy transport Can be rolled in front of behind Treble, Bass and Echo control knobs Mic Input Guitar Input AC 100-240v 50/60Hz Includes Remote Control: Requires 2 x AAA Batteries (Batteries not included) Includes Wireless Microphone : Requires 2 AA Batteries (Batteries not included) Separate Light ON/OFF Switch 14" Extendable Antenna Item Dimensions: 35.4" x 12.6" x 11.5 Item Weight: 31 LB. _gsrx_vers_783 GS 7.0.5 (783). The item "BEFREE SOUND DOUBLE SUBWOOFER BLUETOOTH DJ PA PARTY SPEAKER WITH LIGHTS MIC USB" is in sale since Monday, August 13, 2018. This item is in the category "Musical Instruments & Gear\Pro Audio Equipment\Speakers & Monitors". The seller is "etronicspro" and is located in Los Angeles, California. This item can be shipped to United States, Canada, United Kingdom, Denmark, Romania, Slovakia, Bulgaria, Czech republic, Finland, Hungary, Latvia, Lithuania, Malta, Estonia, Australia, Greece, Portugal, Cyprus, Slovenia, Japan, China, Sweden, South Korea, Indonesia, Taiwan, South africa, Thailand, Belgium, France, Hong Kong, Ireland, Netherlands, Poland, Spain, Italy, Germany, Austria, Israel, Mexico, New Zealand, Philippines, Singapore, Switzerland, Norway, Saudi arabia, Ukraine, United arab emirates, Qatar, Kuwait, Bahrain, Croatia, Malaysia, Brazil, Chile, Colombia, Costa rica, Dominican republic, Panama, Trinidad and tobago, Guatemala, El salvador, Honduras, Jamaica.